At Delaware Back Pain & Sports Rehabilitation Centers we use electromyography (EMG) and neurological conduction studies (NCS) to evaluate the health of your muscles and nerves. If you need to have an EMG/NCS done, we can help. As one of two laboratories in Delaware accredited by the American Association of Neuromuscular & Electrodiagnostic Medicine (AANEM), we have specialized physicians that will work with your doctor to help you on your path to recovery. During the test, we study and measure the way your muscles and nerves respond. This way we can discover any abnormalities in your musculoskeletal or nervous systems. 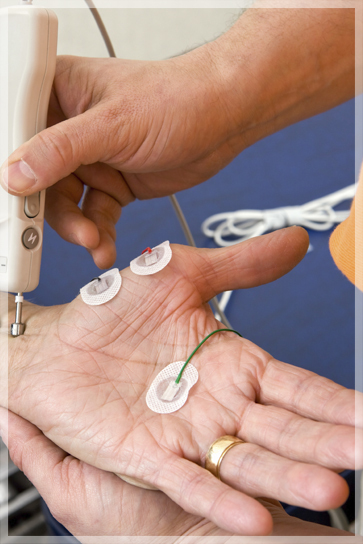 An EMG/NCS involves placing electrodes on your arms and legs to transmit and detect electrical responses. These responses will then be translated into sounds and images that the electrodiagnostic physician can interpret to arrive at a diagnosis. After completing the evaluation, our physicians will send a detailed report to the doctor so they may begin to treat and solve your condition. Our team of medical professionals will help create a customized treatment plan that is designed to reduce pain, restore function, and get you back to health. We have been helping patients since 1986 – let us help you too. Call the Delaware Back Pain & Sports Rehabilitation Centers location nearest you or submit an online request for an appointment today.